Delicious homemade Chocolate Coconut Truffles made from scratch. 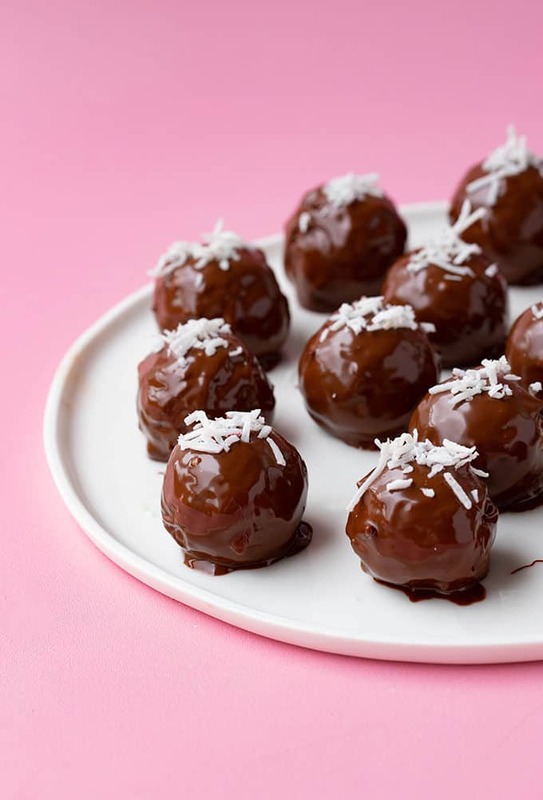 These gorgeous coconut truffles are made with sweetened condensed milk and dipped in smooth milk chocolate. 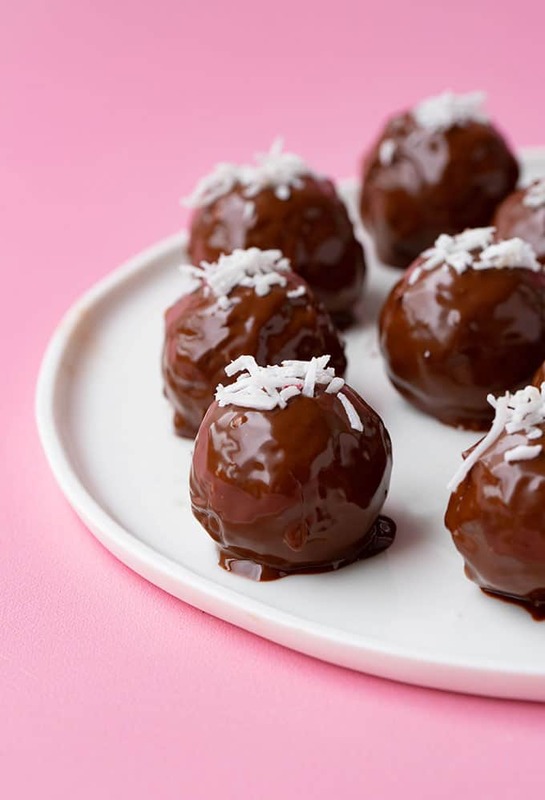 Chocolate Coconut Truffles that are perfect for sharing. These bite-sized treats are completely no bake, come together in minutes, and are gluten free. Sweet coconut dipped in smooth chocolate = completely irresistible. I ate so many of these Chocolate Coconut Truffles. I guess that’s the danger of making something delicious and bite-sized. You always want to reach for just. one. more. You guys know that I love – and I know you love – an easy recipe that uses only a handful of ingredients. Those recipes are the kind that rescue you when you only have a short amount of time or just a few ingredients in the pantry. 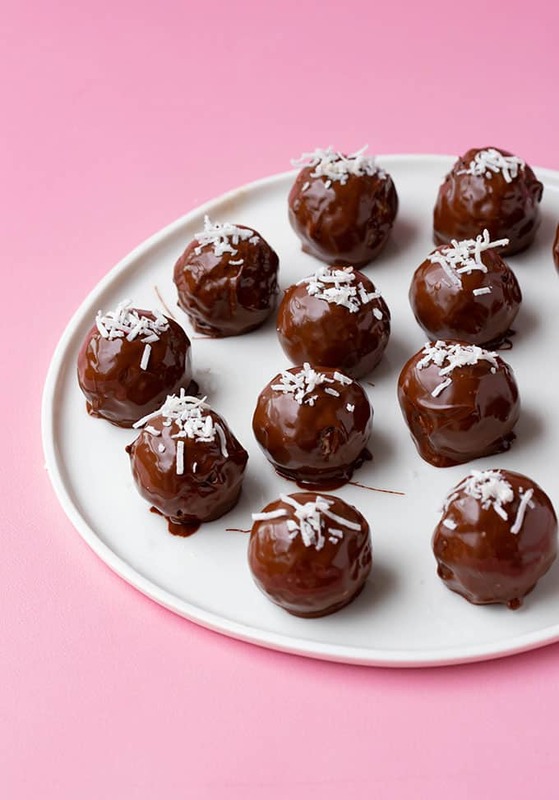 But these easy Chocolate Coconut Truffles are in no way, shape or form lacking taste. Instead, they are absolutely PACKED with flavour. 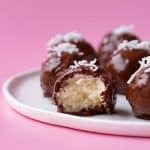 A little icing sugar and condensed milk make the coconut soft and sweet, and once you add a smooth coating of chocolate – well then you’ve got the perfect truffle. All you need is a bowl and spoon to make these truffles – no special equipment required. First, you add the shredded coconut into a large bowl. Add the sugar and the condensed milk and give it a good stir. It might seem a little dry at first, but keep mixing and mixing, until the coconut is evenly coated. If it’s a little wet, add a few extra tablespoons of coconut. What you’ll end up with is a sticky mixture, but you should be able to roll it into balls using your hands. I like to grab a heaped teaspoon of the mixture, and squeeze it tight in my hand, to pull it together, and then roll it smooth. Once you have rolled all the coconut mixture into balls, you can pop them into the fridge for at least 1 hour to set. The longer you leave them in the fridge, the easier they will be to dip in chocolate. I don’t think there is any magic formula to dipping truffles – it’s a messy task. But for me, I find it easier if the truffles are cold. I also use a regular block of chocolate instead of melting chocolate, as I find it tends to set too quickly and seize more easily. I simply use a fork to lift the truffles out of the chocolate, tapping the fork on the side of the bowl to shake off any excess chocolate. Then simply place the truffles on a baking tray lined with baking or parchment paper to set. Store these truffles in an airtight container in the fridge. 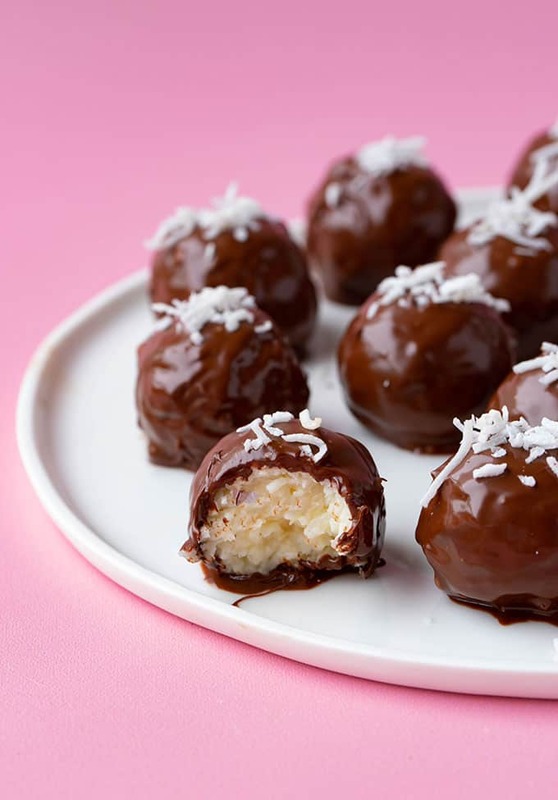 Can you freeze coconut truffles? This recipe was first posted on Sweetest Menu in October 2015. I love chocolate and coconut together! These truffles look amazing! I am planning to make these as part of my wedding favor truffle boxes. how long do they keep without refrigeration? These taste even better than the ones from the supermarket. Yes! So glad to hear that Josh. Hi Fran, thanks for your comment. You don’t have to but it could be a good idea if you live in a warm climate to stop the chocolate from melting. Hope you enjoy them! Does the coconut have to be unsweetened? Hi Joy, thanks for stopping by. I would recommend using unsweetened coconut as there is plenty of sweetness from the powdered sugar and condensed milk. Let me know how you go! I LOVE anything chocolate and coconut Jess! These look just perfect! 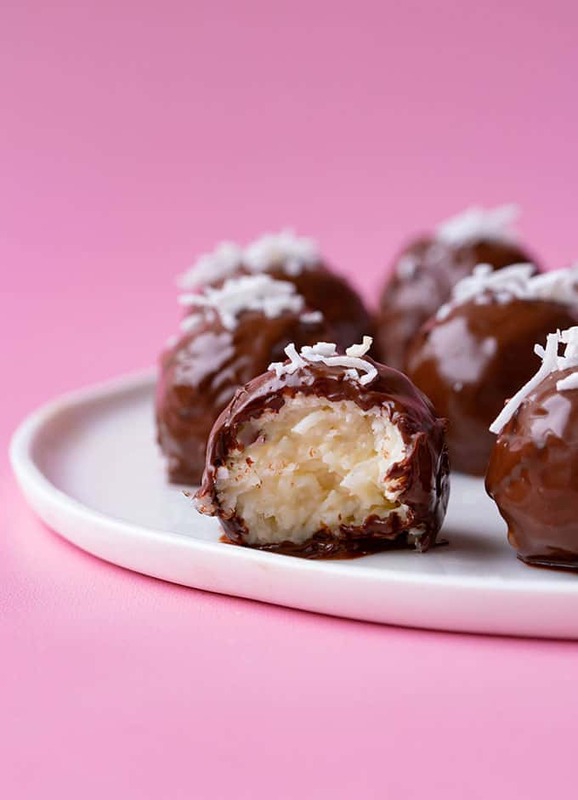 I love coconut and I LOVE chocolate so I think this recipe may have been made just for me! Aw I hope you get to try it Kathy! Yes, coconut and chocolate always win in my book. Almond Joys are one of my favorite candies! I ate so many yesterday, hahaha. These sound delightful! Mine too Lynn! Oh Almond Joys are the best! These look heavenly, can’t wait to treat myself to some of these! Pinning! Oh I hope you get to try them Fida! Thanks for pinning! I love how fancy these look, but they seem so simple to put together. I love that kind of recipe! What a gorgeous dessert! Chocolate and coconut is one of my favorite combos! These truffles look fantastic!! I’ll take 5 please! These look so perfect and delicious! They’re like little bites of Bounty, yum!! Now I can make them for him! I love how easy these are, and they are absolutely perfect for the upcoming holiday season! These little bites of heaven look perfect for the holidays or let’s be real, at midnight when a chocolate craving strikes. 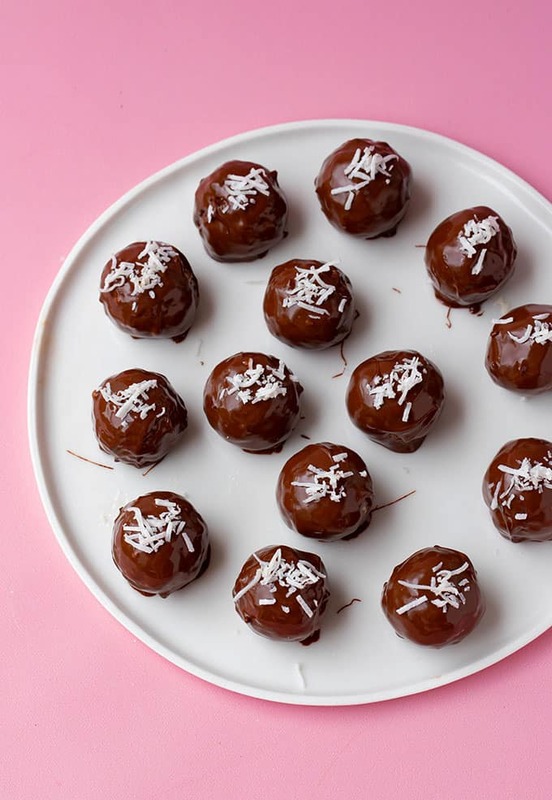 These are perfect little bites for the holidays… I love coconut! And I don’t even have to go through the terrible trouble of unwrapping a candy bar? That is my kind of dessert. Choco-coconut forever! Wow, only 5 ingredients? Heck yes! You’re right – these would make wonderful holiday gifts!! I love how simple and elegant they are. Plus flavor-wise, chocolate and coconut is a combo that you can never go wrong with! Love! !